IowaWatch cofounder Stephen Berry speaking at the 2018 Celebrating a Free Press and Open Government banquet, on Sept. 27, 2018, in Des Moines, Iowa. Editor’s Note: IowaWatch cofounder Stephen J. Berry made the following remarks at the 2018 Celebrating a Free Press and Open Government Banquet in Des Moines, Iowa, on Sept. 27, 2018. The banquet is co-hosted annually by IowaWatch and the Iowa Freedom of Information Council, with the Iowa Newspaper Foundation. Good evening. Thanks for coming to our annual banquet so that we can celebrate the free press. I hope you enjoyed the reception and the meal. Thanks to Lyle and the IowaWatch staffers for doing such a fine job putting this together. I would like to personally congratulate our award winners. All of us, including the general public are indebted to you for your service. Have a response? We encourage you to write it in the comments section. Interestingly, though, Archdalians views about “the media,” which is they don’t trust us, mirror the opinion polls that I’ve been studying since I was invited to give this talk. This is what prompted me to start thinking about public/press relations, more specifically whether people, if they genuinely understood what we do and how we do it, would they mistrust us like the people of Archdale and respondents in opinion polls suggest. And those thoughts actually generated some ideas on what we can do about it, which I’m going to share with you tonight. I have no idea whether these ideas reflect the consensus of the IowaWatch board of directors, so you must understand that what I say tonight is not as a representative of IowaWatch but as individual, for whom journalism has occupied 5/7th of my of life and an even greater proportion of my identity. As I just said, most people don’t trust us, and I am sure you know that already. But did you know 7 out of 10 trust us less this year than they did in 2006. When I was a reporter, I tried not to worry about such things. It seemed there wasn’t and point to concern myself with such things. What could do about it, anyway? Besides, I’ve got a story to get done before some editor starts harassing me. I, and probably most other journalists, escaped the angst such public opinion might cause by just focusing on my job, doing the best I could and hoping everything will turn out OK. Lately that hasn’t worked so much, and I admit I’m getting worried. Not just because of the numbers. But because of the depth of feeling and the personal turn it has taken, the increased physical attacks and threats against journalists combined with the magnitude of the governments attack. Nixon didn’t even do that. He just marinated in his hatred privately, unleashing his attack dog Spiro Agnew to go after us with his amazing alliterative creativity. What makes these current attacks important to our viewers and listeners is that are conjoined with the government’s shamelessly flagrant campaign of lying and distortion, which is carried out through its unprecedented access to social media tools, a subservient cable news network and several web sites. This combination of anti-press rhetoric and propaganda campaign is that it is creating a mythical reality, which is populated by a maniacal mass of mesmerized millions. As I survey the half-century of journalism that I’ve a experienced, studied, and described in journalism classes, I see that trend in vivid, overwhelmingly dark colors. But there is some news and developments which brighten things a little and maybe give hope that we can do something about public mistrust of the media. 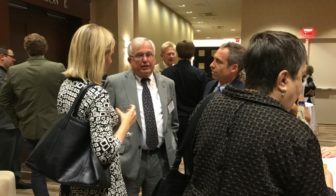 IowaWatch co-founder and board member Stephen Berry (center) talks with fellow board member Lisa Rossi (left) and Michael Rossi at a reception before the 2018 Celebrating a Free Press and Open Government Banquet in Des Moines on Sept. 27, 2018. Did you know that most people have opinions about what constitutes good journalism that are similar to what journalists think, according to a May 2018 American Press Institute study called “The Media Insight Project.” So that’s something we should be able work with. Also, fact-check columns are becoming more common, and more popular among readers, which I think constitutes positive evidence of what readers honestly want and will use. And, thanks to digital tools now available, you can do more and better fact-checking on deadline than we could in my day, which is responsive to public desires. Data analysis reporting capabilities are breathtaking and allow us to show readers the evidence we use to back up our reporting. Moreover, I see a few time-worn journalism standards evolving that is in response to the pervasiveness of deception in political discourse and will engender more trust from the public. For example, in reporting on deception, when journalists document falsity and intent, more news organizations are willing call a lie a lie. They are recognizing that there are varying degrees of deception and are using care in reporting them. For a journalist from my era, this is revolutionary. As for press performance under the trying circumstances under which they work, the Washington Post, New York Times and the Wall Street Journal and some others have been doing amazing work over the past three years. They have published a tremendous number of stories exposing corruption and abuse of power in the Trump administration. Showing they let the chips fall where they may, they also have uncovered major stories that questioned Hillary Clinton’s credibility and judgment and others that pro-Trump forces’ lapped up and used in their efforts to discredit the Mueller probe. Right here in Iowa and in my home state, I have seen great accountability journalism from a range of journalists as well as from a range of newspapers. 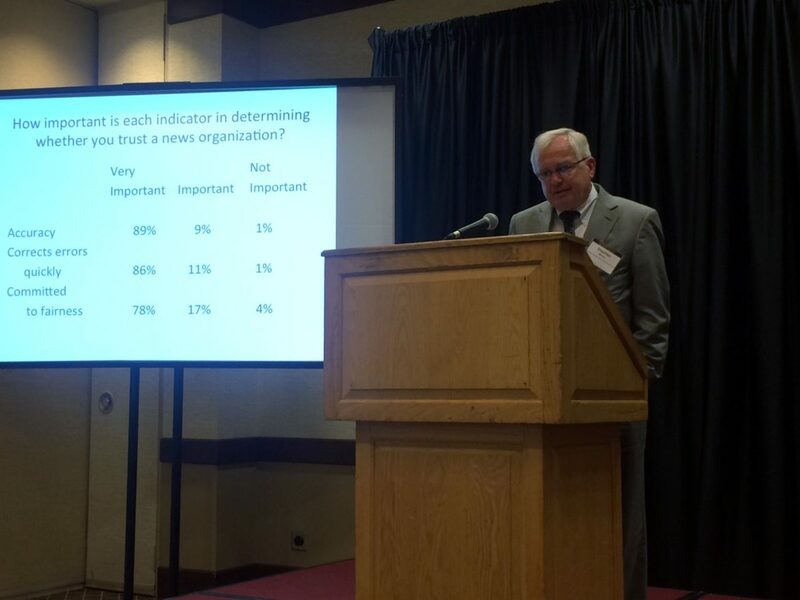 So, what do we do to regain public trust? Where do we find the answers? In preparing for tonight, I found a very interesting and well-done survey conducted by Gallup and the Knight Foundation that gave me reason for hope and some ideas on where we should go from here. It did two separate surveys to try to determine what attributes that Americans honestly would expect news organizations to possess to earn their trust. The two highest-rated indicators for trust — both rated as very important by almost 9 in 10 respondents — are a commitment to accuracy (89%) and quickly and visibly correcting mistakes (86%). Just continue down the column of numbers, and you will see how important facts, research, transparency, separating fact from opinion are to people when the evaluate trustworthiness. Now keep in mind, they selected these out of 35 other attributes, indicating they were giving serious thought to their opinions. Here I’m going to into the weeds a bit, so follow me closely. First, readers’ transparency concerns show we need to change the way we use anonymous resources and report what they tell us. I cannot overemphasize too much how people misunderstand how and why we use them and believe such sources freely fabricate information and we have no way to prevent it. This constitutes a huge source of suspicion. All of this suggests a need for policies on proper use of unnamed sources, and stories that use such sources should contain a link to that policy. They also should include a methodology paragraph and link to a brief in which the front-line editor explains the decision-making, the nature of the confirmation, the vetting process and other information that will help the reader evaluate source credibility and your decision to use the unnamed source. Provide more credentialing information about named sources. Write at least one complete sentence – two preferably – in addition to the title of the source – in the body of the story and then provide a link to a separate brief that provides more credentials. Provide access to additional information beyond what’s in the story in several ways. This should be supplemental material to support your reporting or resources that let readers learn more on their own. As often as possible, provide a transcript of complete interviews of the key source or sources in a story. Adopt the “Truth Sandwich” story structure when writing about a false or unsupported allegations by public figure. I got that term Prof. George Lakoff, the prominent Berkeley linguist, who offered it up in a recent article as way to use the inverted pyramid to prevent news makers from exploiting a basic journalistic technique to propagandize the public. The truth sandwich makes the lead sentence, the next 2-3 grafs, the context graf and lead quote and, thus, the headline and story focus on the fact of the deception rather than on the contents of the deceit. The contents of deceit are sandwiched between those opening sentences and the concluding paragraphs, which provides facts and quotes that explain the truth andexplore the credibility of the purveyor of the falsity in whatever ways the reporting uncovers, like his or history of spreading false information, distortions, etc. Reduce the Perception of Bias: The American Press Institute’s Media Insight Project in May 2018 explained why people think the press is biased. It revealed that nearly half didn’t understand the difference between news and editorials, that public perception of bias stems from political news analysis and speculative political stories, with nearly 2/3rds wishing reporters would stick almost entirely to straight news with some factual contextual information and some analysis. The lesson? Curtail political analysis and speculation. Go back to mostly straight news reporting. Also, news organizations need to stop putting their editorial page columns on the first screen next to the news on their websites. News reporters need to stop appearing on cable news talk shows where they sit side-by-side with opinion commentators, partisan political consultants and the talk show hosts who have distinctly ideological leanings on the right or left. When they do, their reputations are soiled in the eyes of the public by their association with the opinion commentators. Political Reporting: National political reporting, in my view, requires a monumental overhaul. Generally, policy positions and the desire to create a well-informed, intelligent voting public – not politics – should drive political reporting. Politics should be relegated to context or background paragraphs with a sidebar brief or polling graphic; reduce the amount of arcane campaign strategizing; cut the amount of whose-ahead polling and the number of horse-race stories; drastically reduce the amount of analysis and speculation, which seldom does anything to advance the public’s ability to cast an informed vote. Pure political stories should occur only on a major breaking story, such as a pivotal gaffe, a poll that comes at a significant point in the campaign or reveals a dramatic change in the horse-race line-up. 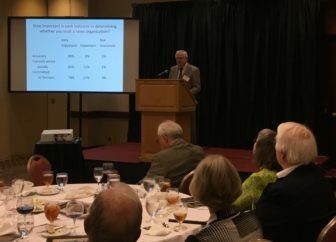 IowaWatch co-founder Stephen Berry giving the main address at the 2018 Celebrating a Free Press and Open Government Banquet in Des Moines on Sept. 27, 2018. Beyond journalistic reforms, news organizations, again strictly in my personal opinion, must start defending itself overtly and persistently. Most editors, I suspect, argue that attacks on the press is just part of politics, and journalists don’t participate in politics. They say just stick to the traditional truth-always-wins defense, i.e., nose to the grind stone, do your job, be fastidiously accurate and don’t worry about the critics. I believed in that approach for the 33 years I practiced journalism as reporter, for the 12 years I taught it as a journalism professor and for two of the three years that I have lived as a retiree and studied it. But now, I find myself asking, is that enough? The answer is No, It Is Not Enough. It’s not, because this onslaught didn’t start with President Trump, nor will it end or even diminish when he’s gone. Trump is merely an exponential progression of what started with Spiro Agnew. As the polls show, his relentless branding campaign around terms like “Fake News” and “Enemies of the People” is working, and I’ll bet you dollars to donuts the President’s anti-media tactics are going to be studied, copied and improved upon in succeeding administrations. Yes, we must keep seeking the truth and reporting it. And, yes, we must do it with more vigor than before. What else should we do? Mostly, this responsibility falls to journalists at a higher pay grade than the work-a-day shoe-leather reporter. A few weeks ago, the Boston Globe called on editorial page editors nationwide to join it on a day certain to write editorials addressing President Trump’s declaration that journalists are the “enemies of the people.” It was a huge success – 350 newspapers responded. That’s the spirit of the type of strong, dynamic reactive self-defense that I’m talking about. It must be a multi-dimensional, daily, relentless and in your-face, but remain religiously reactive – that is hit back only when someone hits first. Not only must our industry respond within the daily news cycle when attacked but cover and investigate allegations when they are made. Donald Trump has made journalism and journalists major news for two reasons: 1. He has acknowledged a campaign to “discredit” and “demean” journalists has become a central and very effective piece of a White House strategy to destroy the effectiveness of the press. 2. When there is an organized governmental campaign by the government to discredit the primary American institution that is constitutionally sanctioned as guardian of the public’s right to a free press, that is a story, and it is a huge one. So, someone needs to write a multi-part series about this, and other news organizations should pick it or do their own series. To not cover this development as a news story with as much accountability reporting and public spiritedness as we cover a Supreme Court nomination or Hillary Clinton’s email server is bad news judgment. But in thinking about how we have been ignoring this controversy in daily reporting, it has occurred to me that we need to ask ourselves this – is journalism living up to its duty as guardian of the public’s right to free and effective press if fails to respond to inaccurate attacks on this profession? In trying to fill that gap, journalistic conflicts of interests are certain to emerge in whatever is decided upon. But mitigation of such conflicts accompanied by full disclosure and other transparency measures are possible on a case-by-case basis and are not unprecedented in our history. Journalists and entire news organizations have faced this predicament before and have established a record for dealing with them that can serve as a starting point for devising strategies and tactics. Despite ethical issues that might crop up, journalists can write about journalism. Journalists, in the course of their reporting, have – through no fault of their own gotten caught up in a story and they or their editors have had to write about it. Nationally, we have journalists who thrive in such organizations as the Columbia Journalism Review and FAIR, where they are reporting on and analyzing and investigating journalism. How many times have news organizations done in-house investigations when they did something that generated controversy. The L.A. Times did it on the paper’s Staples Center conflict-of-interest controversy in late 1999 after a newsroom revolt attracted intense coverage from other journalists. The New York Times did one over its coverage of the run-up to the Iraq War. In both instances, the reporters produced hard-hitting findings enumerating the shortcomings. Many large papers like the Los Angeles Times have public relations operations. Among its many duties is handling press inquiries, including those from its own reporters, about journalistic transgressions. 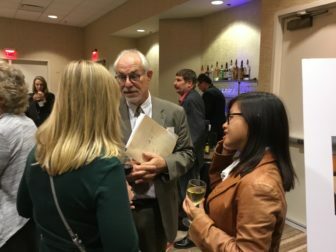 IowaWatch Executive Director-Editor Lyle Muller talks with Des Moines Register journalists and former IowaWatch reporters Makayla Tendall (left with her back to the photo) and Linh Ta at a reception before the 2018 Celebrating a Free Press and Open Government Banquet in Des Moines on Sept. 27, 2018. So, with our profession’s background and record of self-investigation, public relations and involvement in news coverage about journalism and about their own work, does it require a great leap for our profession to examine what we have long been doing at the micro level and to create new entities or use existing ones to do the same on a macro level? Is it unimaginable to imagine the emergence of a new field of journalistic study and investigation that would be independent of any single news organization, and its sole duty could be to cover and investigate broad-side, generic allegations against the media as well as specific allegations pertaining to select stories of significant national impact. Is it really a great leap to examine current news organizations’ public relations arms to consider the feasibility of a news media public relations arm charged – not with promoting or selling journalism or launching an attack against critics – but only with monitoring and responding ad hoc – but aggressivelyn – to criticism and commentary involving our profession? Would it violate ethics if journalism leaders who enjoy national prominence and respect to became de facto representatives of the profession in public controversies about the profession? Finally, a number of professional associations or entities could step up, such as the American Society of News Editors, American Press Institute, SPJ, Poynter to develop a strategy. No longer can the press stand silent and allow propagandists to assert to millions of viewers and readers that journalists are spreading “fake news,” that they are “enemies of the people” without fighting back? To conclude, I urge you to consider that in our struggle to win the public’s trust, silence is dangerous. It creates a vacuum that demagogues and fear-mongers love to fill. As a son of the Deep South who grew up there in the 1950s and 1960s, I lived in a mythical reality that the demagogues created and God-fearing folks ignored or pretended obliviousness. To this day, I still am in awe at how effective, corrupting and all-encompassing that myth-making was. I have always felt confident since then something like that could never happen again. Then November 2016 happened. And, I cannot help but ask myself what I am asking you tonight – can you and I, who are the destroyers of myths, the stewards of the public’s right to a free and unfettered press, the truth seekers, afford to fail as the Southern press failed in that horrible era? Can we let the fear-mongers and demagogues once again fill the silence? Thank you for listening and considering my ideas. How important is each indicator in determining whether you trust a news organization? Respondents: 1,218 adults; Margin of Error: +-4%. Confidence Level: 95%.